Thank you for your past support and interest in our handcrafted limited production wines. As Mules, you are the first ones to hear that our 2006 wines will be available February 2009. 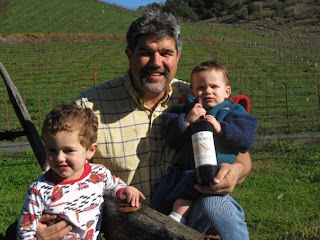 We know you’ll love what we produced in 2006 – we think this was a great vintage for Puccioni Vineyards! As always, we want to give our loyal Mules the first opportunity to order our new release wine. Place your order by April 15, 2009, and get a 25% discount on Zin, 20% discount on Petite Sirah, and if you order 2 or more cases get free shipping! What could be better than having some delicious Puccioni wine ready to uncork and enjoy after you send off your tax forms? The grapes for this wine were sourced from 100-year-old vines at the Puccioni Ranch that were planted by our great-grandfather, and 50-year-old vines planted and farmed by our cousins (not sure if they will admit it?) at the Buchignani Vineyard on Dry Creek Road. The wine has lovely aromas of ripe blackberries with hints of violet and cedar, and dark cherry/chocolate flavors balanced with that characteristic Puccioni spice in the finish. This wine is ready to be enjoyed today, but can be aged for a few years too. We are excited to be offering a VERY limited bottling of a vineyard-designated Petite Sirah for the very first time! The grapes came from Lambert Bridge Vineyard (Van Alyea) in the heart of the Dry Creek Valley – just after Lambert Bridge. The wine has deep, dark berry aromas, blueberry and chocolate flavors through the mid palate, finishing with black pepper spice. You can age this wine, but don’t be afraid to drink this Petite Sirah now – why wait?! We really like the 2007 wines that will be bottled in a few months, and the 2008 wines are showing some great intensity at a very young age. The Old Vine Zin and Petite Sirah will continue to be our focus with these vintages. As always we would love to hear from you – what you like, where and with whom you are drinking our wines, and those “I’ll bet you never heard this story before” stories. We are making the wines for you to enjoy and share with your friends and family – because nothing is more special than Friends, Family, and some nice Zin! Please Note: Habu and Muddy’s pictures are in the new Wine Dogs USA 2 book. Check it out at your local bookstore! Our family used a Mule and a plow until 1968. My grandfather had four mules through the early and mid 1900s – his favorites were Jack and Prince. Prince, our last mule, always came home at 6pm, whether my grandfather was done in the field or not. You could say we’re as stubborn as Prince when it comes to "doing things the right way”! Puccioni Vineyards produces hand-crafted Zinfandel wine from our vineyard in the hills of Sonoma County's Dry Creek Valley, where we have a long family heritage in the wine business. In 1904, our great-grandfather Angelo bought the property and planted Zinfandel grapes that have been growing there ever since. Our family ran a winery on the property from 1918 to 1935. 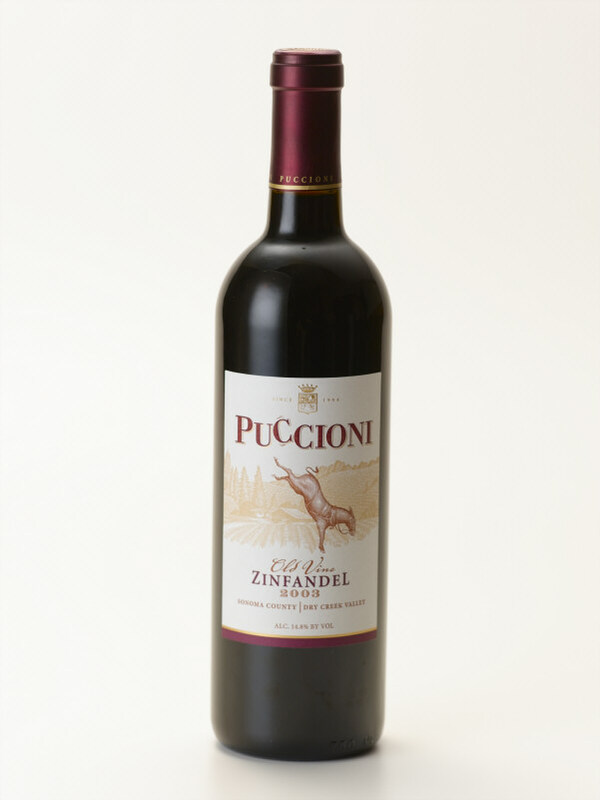 Puccioni Old Vine Zinfandel is made using those 100-year-old vines and the knowledge passed down from our family’s generations of winegrowers and winemakers. We poured at ZAP two weeks ago - it was a great event as always. My Uncle Angelo Puccioni, and my cousin Allison and her husband Tim helped me pour. We poured the 2005 and 2006 Old Vine Zinfandel - We got a great response on the 2006 - with at least two writers/retailers ranking it in the top five of the entire tasting!!!!!!!!!!! We were extremely happy with that. Also we got a nice write up in the Connoisseurs' Guide - They gave us one puff and an 87 - using the descriptors - gutsy, deep fruit, sweet oak, ripe, extracted - and said it would go well with hearty barbecued meats on the bone. I will add some pictures with the next post - need to get those from my uncle. Also you have to love the rain - keep it coming we need it.